Magic Leap—valued at more than $4.5 billion—is one of the most secretive (and exciting) technology companies in the world. Despite its fruitful fundraising campaigns, the company has never released a commercial product and very few people have ever tried its state-of-the-art augmented reality headset. Now, a new patent may finally give us some insight into what we can expect from the mysterious company. Today, a design patent awarded to Magic Leap appears to reveal what the company’s head-mounted display may look like. In sketches from the filing, the device looks a lot like a bike helmet for your face. Since this is a design patent, there is (unfortunately) very little information about how the headset will work. It’s important to remember that these patents be viewed with a healthy dose of skepticism. 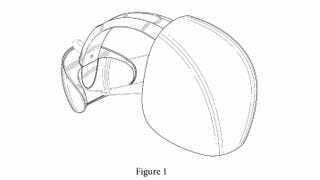 This isn’t even the first time a Magic Leap headset patent has been discovered. Back in January 2015, Gizmodo reported on a suite of wearables outline in a Magic Leap patent that included what appeared to be an augmented reality heads-up display. Whether either of these patents will ever see the light of day remains to be seen, but in the meantime, one thing’s for sure: We are all frothing over Magic Leap’s tech and the dream of trying it out.